As a former publicist of 10+ years, I know a thing or two about the subject—and I’ve seen countless up-and-coming entrepreneurs struggle with it. Truth be told, I would’ve been in the same boat if my business didn’t stem from a career in publicity. These beliefs are simply not true. Everyone has something unique to offer. It’s all about tapping into your strengths and showing up from a place of service. 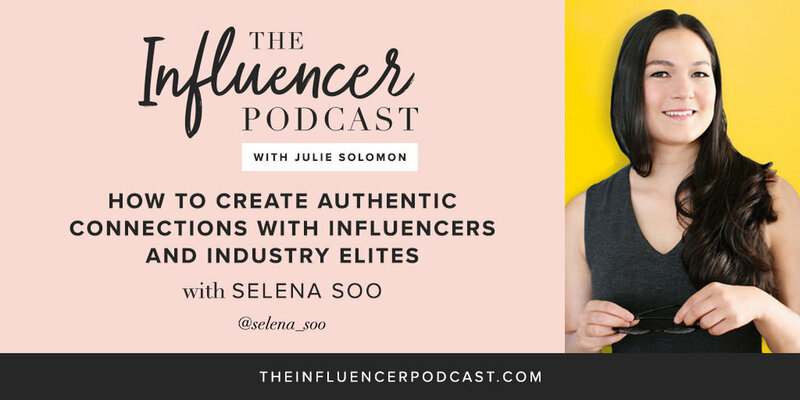 And I can’t think of anyone better to talk about embodying confidence, networking authentically, and building long-lasting relationships than Selena Soo. Selena is a publicity and marketing strategist who helps entrepreneurs, experts, and authors reach and impact millions with their message. In this episode, we talk about not only the importance of building meaningful relationships with influencers and industry leaders—but how to go about it from a place of authenticity and service. Selena also shares what she learned on her own journey from burnt out and underpaid to thriving seven-figure business owner. And guess what? She’s an introvert! Which is proof you don’t need to be an extrovert to network like a pro. If you loved this episode, you’ll also love Episode #17: “How to Get Paid for Being Yourself and Land Free Publicity for Your Business,” where I share a ton of secrets and insider tips from my 10+ years as a publicist, influencer, and marketing strategist. I’d love to know … do you have any go-to networking questions? Share ‘em with me in the comments! You know I love to chat … especially with you! Snap a screenshot and tag me and @selena_soo on Instagram as you’re listening to this week’s episode. And remember to hashtag #theinfluencerpodcast, that way I can share your screenshot on my story too!